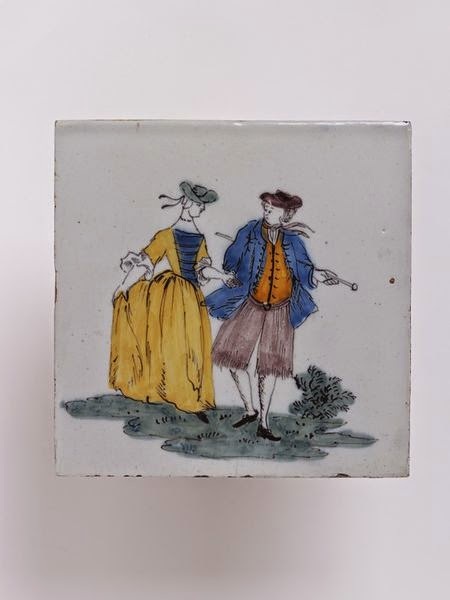 Tile, artist unknown, c. 1758-1775, Victoria and Albert Museum Collection. Manufactured in Liverpool, England, this tile features the commonly depicted scene of a sailor and his lass. They stroll hand in hand across green grass while gazing into each other's eyes. As romantic a scene as any I've featured here! The sailor wears a reversed cocked hat over short cut and curly hair. His neckcloth blows in the breeze and is of a solid color, probably white though the paint from his jacket and waistcoat bleed over the lines. Our tar's waistcoat is of an orangish-brown hue and single breasted, though he hasn't bothered to fasten a single of his buttons. A single breasted blue jacket, ending at the top of the thigh, lays atop that. His slops, brown in color, are decidedly fastened over his waistcoat, rather than beneath them. Interestingly, the slops appear to be fringed at the bottom. It is probably not an intentional fringing, but rather wear from use. I've never seen another pair with such a feature. His stockings are white, and he has a walking stick or cane tucked under his arm.